The notoriously silent Supreme Court Justice Clarence Thomas asked several questions during oral arguments Monday in a case about a ban on gun ownership for domestic-violence offenders, BloombergBNA's Kimberly Robinson tweeted. Thomas' questions came right after an attorney was ready to end early and said "If there are no more questions," according to Robinson. "Thomas asked if any other constitutional right could be suspended based on a misdemeanor," she tweeted. Last week marked the first time the high court heard oral arguments since the death of Justice Antonin Scalia. That day also marked 10 years since Thomas had asked a question from the bench. Since then, with the exception of oral arguments Monday, Thomas has not even spoken from the bench during oral arguments except to crack a joke about Yale in 2013. Thomas hasn't been completely mum on why he usually asks no questions. At an event in North Carolina in June 2012, Thomas said he would get rid of oral arguments if he could, which sheds some light on why he might not be such an eager participant in them. Thomas has also pointed to his Southern background and introverted nature as reasons for his epic silence. "I don't see where that advances anything," Thomas said at a speech in 2012, referring to asking questions. "Maybe it's the Southerner in me. Maybe it's the introvert in me, I don't know. I think that when somebody's talking, somebody ought to listen." Jay Wexler, a former clerk for Justice Ruth Bader Ginsburg, has previously told Business Insider that Thomas is actually the most approachable of the justices. "He gets kind of a bad rap because he doesn't talk at oral arguments," Wexler told us. "I think it's fine that he doesn't talk at oral arguments." 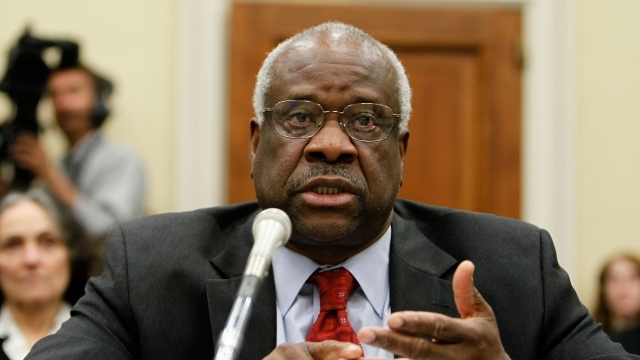 Other clerks at the Supreme Court also didn't hold Thomas' silence against him, according to Wexler. They took Thomas at his word that he just didn't think questions were all that helpful. By contrast, Scalia often dominated the questioning during oral arguments. "Oral argument ... changed completely after he went on the bench. I will miss that," Carter Phillips, who has argued more Supreme Court cases than any other lawyer in private practice, told Business Insider in an email after Scalia's death. Phillips added: "Prior to him, the normal argument might generate 10-15 questions in 30 minutes. Sometimes even fewer. He [Scalia] would ask 10-15 questions by himself."